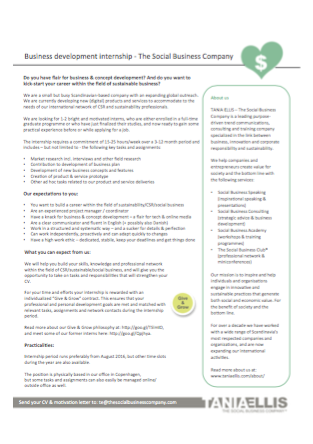 Do you have flair for business & concept development? And do you want to kick-start your career within the field of sustainable business? We are a small but busy Scandinavian-based company with an expanding global outreach. We are currently developing new (digital) products and services to accommodate to the needs of our international network of CSR and sustainability professionals. We are looking for 1-2 bright and motivated interns, who are either enrolled in a full-time graduate programme or who have just finalized their studies, and now ready to gain some practical experience before or while applying for a job. We will help you build your skills, knowledge and professional network within the field of CSR/sustainable/social business, and will give you the opportunity to take on tasks and responsibilities that will strengthen your CV. For your time and efforts your internship is rewarded with an individualized ”Give & Grow” contract. This ensures that your professional and personal development goals are met and matched with relevant tasks, assignments and network contacts during the internship period. Read more about our Give & Grow philosophy here. Meet some of our former interns here. Internship period runs preferably from August 2016, but other time slots during the year are also available.